Have you ever received an email from someone marked as “IMPORTANT!” only to find out that it is some end-of-the-world hoax chain-email that is going around? I’ve had my fair share, and I’ve also had enough. 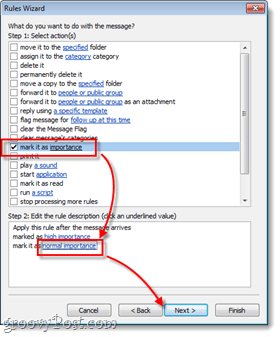 The importance flag for emails in Outlook and elsewhere has been abused beyond forgiveness, and it’s time to make all emails treated equally. 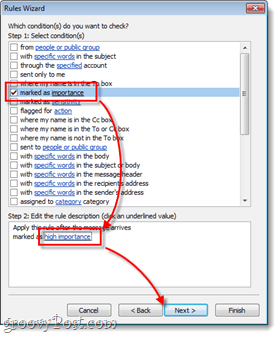 In this groovy tutorial, we’ll make Outlook ignore whether or not an email is marked as “Important” and just treat all emails the same. 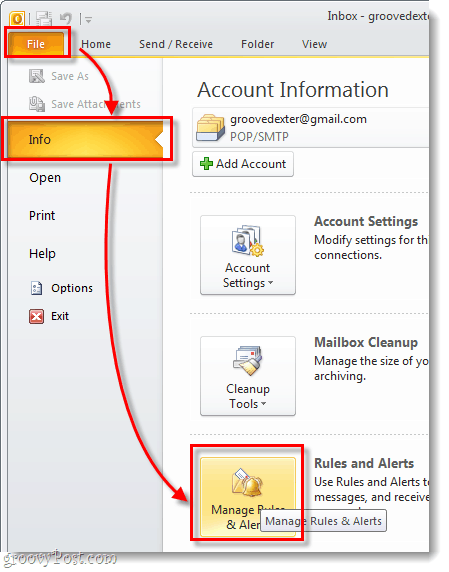 In Outlook, in the File ribbon Click the Info > Manage Rules & Alerts button. 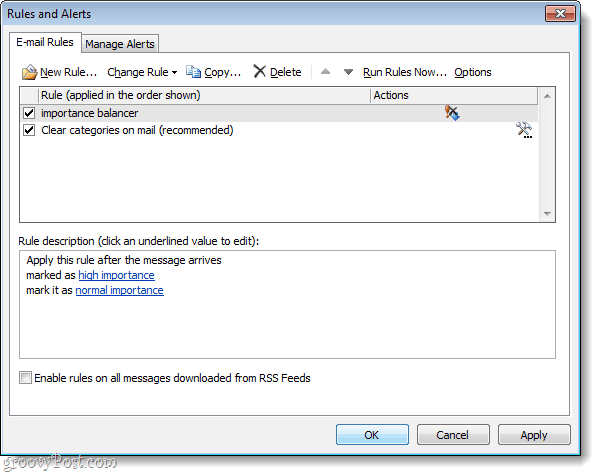 A pop-up window should appear with titled Rules and Alerts. Click New Rule… at the top-left of this window. Now you’ll be in the Rules creation Wizard. 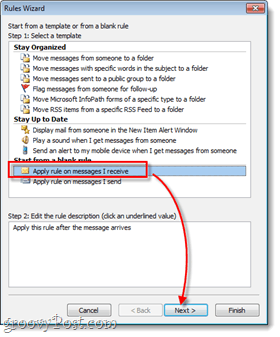 We want to start from scratch, so Select Apply rule on messages I receive and then Click Next. 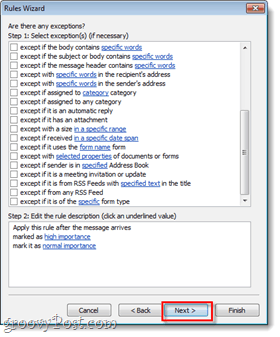 On the next page Check the box titled marked as importance, then below in the Step 2 area change the importance to high importance. Once you’ve got this set up, Click Next. The next window is similar to the previous; Check the box labeled mark it as importance and then change the importance level below. However, this time in the Step 2 box set it to normal importance. Once done Click Next. You’ll be offered some exceptions to this rule, which could be handy if you wanted to keep emails from your boss marked as important or something. You don’t have to set exceptions though, so either way just Click Next and you are finished. Now all that is left to do is name your rule and run it. You can name the rule whatever you like, but keep it something relative so that you know what it is later (and it can also save your in-house tech support guy some time). Once you’ve named it, Check all of the available boxes and then Click Finish. 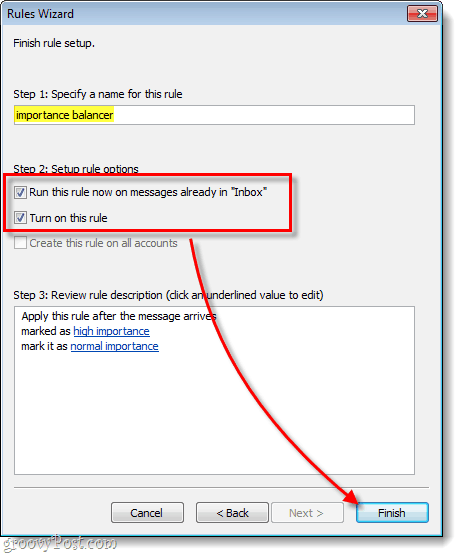 Now you you have a new rule set up in Outlook that will take emails marked as “important” by other people, and turn them into just regular emails. 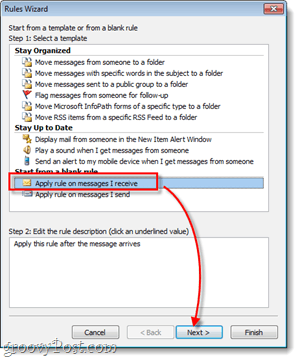 If at some point you ever want to go back to normal, just into Rules and Alerts (as shown in Step 1) and uncheck or delete this rule.